Our VAC Main Bearing Sets are specially coated to reduce friction to a minimum; enabling lower temps and faster revolutions in your expensive BMW engine. Our Coated High Performance Bearing Sets are thermal breakdown resistant, helping to prevent premature engine failures under stress when things are most critical. These bearings can last much longer than any normal bearing sets and are used in all our highest performance BMW engine builds. Embedibility factor is excellent; this allows our bearings to keep dirt and debris from harming the crank surface better than standard bearings. These bearings have become a favorite product of all our race and engine building customers around the globe who have reported unparalleled wear characteristics under all conditions. Made to our specifications with the same technology used in US military and other engines that require "mission critical" endurance. If you are looking for high performance Main Bearings, this is the set for you. As with all bearings, please check your tolerances and size before installation. Sizing of your connecting rods is normal. Due to the specialize tools needed, professional install recommended. 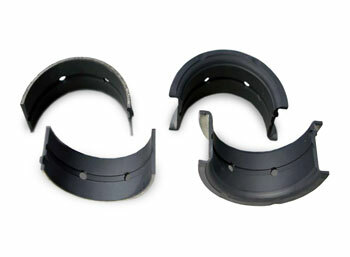 Our coated bearings run a bit tighter than OEM, and allow you to run the tolerances you wish. Please size accordingly. There are no returns available on any engine bearings.